The International Bowl game is the, fairly new, annual college football bowl game in the post-season that is played on non-U.S. soil. Traditionally it takes place in very early January (usually the 2nd day of the new year) in Toronto, Ontario, Canada. Yes, in Canada - which gives it the name 'International'. Although, there was another bowl game played way back in 1937, the Bacardi Bowl, when Auburn and Villanova faced each other in Cuba. The game features a team from the MAC (Mid-American Conference) and the 4th of the Big East Conference. The Bowl is quite new. The first game very played was just a few years ago in 2007 (at the end of the 2006 season), after Toronto had successfully bid to host a bowl game in the city. Toronto has a SARS outbreak in 2003 and plunged into problems in the tourism industry due to that fact. The bowl game was supposed to generate revenue from visitors coming from outside of Toronto and Canada. Who knows, without that epidemic there may not be a bowl game outside of the U.S.
For the 2010 bowl game the following teams will be matched-up: The South Florida Bulls, representing the University of South Florida (USF) from Tampa, FL in the Big East Conference vs. the Northern Illinois Huskies, representing Northern Illinois University, DeKalb, IL in the MAC (Mid-American Conference) West. There is currently no (and has never been) a title sponsor. 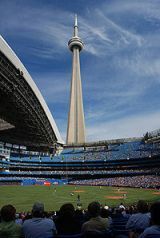 The game is being played at Toronto's Roger's Centre (you may know it as SkyDome as well), which is a multi-purpose stadium near Lake Ontario and next to CN Tower, opened in 1989. It can seat up to over 69,000 spectators for different sports and concert events. Besides providing space for many different events, the Centre is home to MLB's Toronto Blue Jays, CFL's Toronto Argonauts, and even the NFL's Buffalo Bills, who play one game per NFL season in Toronto. Buy your International Bowl Tickets now before it is too late and be one of the tens of thousands enthusiastic fans in this great stadium.